In 1947, Albin Nestberg became Police Chief and the only day policeman in Carrabelle. He and his night officers had several jobs – to protect the citizens, answer calls, pump water for the tugboats at the City Docks, catch speeders on US 98 (old 319) and tend to all prisoners in the jail at City Hall. They needed help in a big way. In 1953, the phone company installed a phone-in call box bolted to the wall of the building on the NE corner of Tallahassee St. and the highway. Here the officers could answer calls while out walking the beat. But then they began to have problems with folks making unauthorized long distance calls on the police phone. The vandals also loved to mess up the phone as often as possible. Johnnie Mirabella, St. Joe Telephone and Telegraph’s lone employee at the time, first tried moving the call box to another building, but the illegal long distance calls continued. He also noticed the policemen would get drenched while answering phone calls in the rain. So when his company decided to replace a worn-out phone booth with a new one, he decided to solve both problems at once by putting the police phone in the old booth. On March 10, 1963, Mirabella with the help of Deputy Sheriff Wilburn “Curley” Messer, moved the phone booth to its current site on US 98 under the chinaberry tree. The Chief hired a man to do the lettering to mark if officially as The City of Carrabelle Police Station. It worked well and greatly increased the efficiency of the 2-man police force. They now could park the patrol car in the shade of the chinaberry tree, do required paperwork, and listen for the phone while watching for speeders and other suspicious characters. The booth still protected the officers from the elements, but while they were out performing other duties, people still continued to sneak in and make long distance phone calls. Eventually, the dial was removed making it impossible to call out, but the phone booth itself continued to faithfully serve the town for decades. 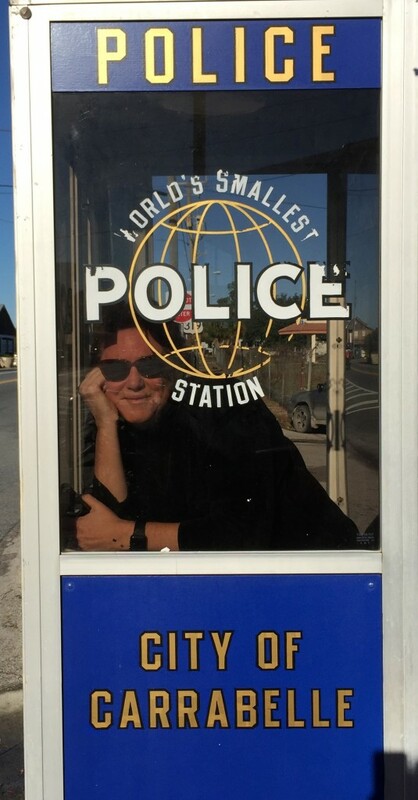 In 1991, The World’s Smallest Police Station was featured on the television show “Real People” and later that same year, Johnny Carson conducted a lively interview with then Carrabelle Police Chief Jessie Gordon Smith on the “Tonight Show”. It’s been featured on other shows, “That’s Amazing”, “Ripley’s Believe It or Not”, “The Today Show” and in the movie “Tate’s Hell”. 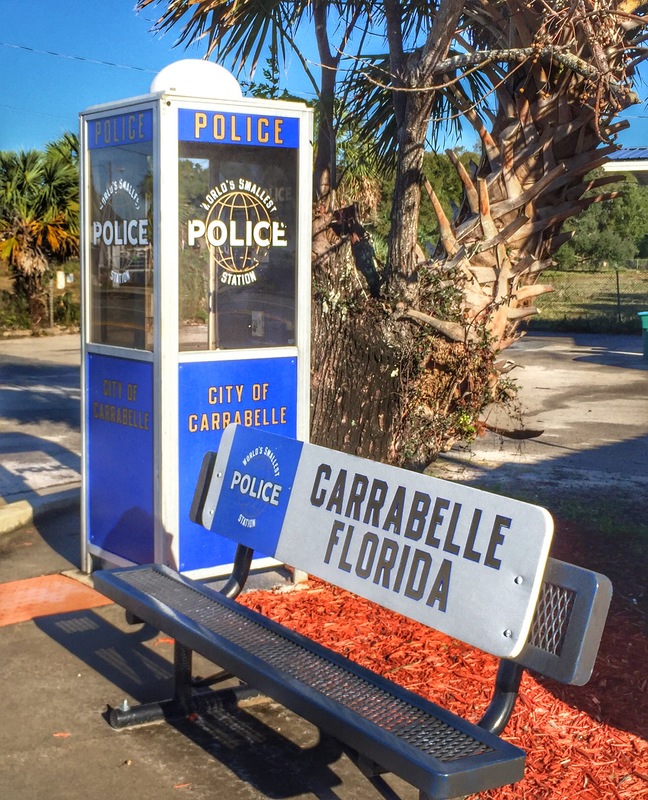 If you’re not careful, you’ll blink and miss it, but it’s definitely worth your time to take a quick detour off of Highway 98 and visit Carrabelle, Florida’s World’s Smallest Police Station!